I've said before that it is important to know about history because not knowing it is what makes us prone to repeat it. Then again, perhaps it will always repeat itself because each generation seems to need to learn the same lessons as the last. One of my favorite eras of history to read and learn about is World War II. So when I was offered the chance to participate in a book tour involving Night of Flames : A Novel of World War II, I leaped upon it. I have asked myself on more than one occasion why it is that I like World War II so much. I've never been able to answer this question until quite recently. The reason that I feel drawn to it is, I believe, because it is a period in time when right was clearly right and wrong was clearly wrong. Or, at least, that's how it feels for the most part. It takes a sick person to say that the Nazis were in any way to be viewed as being "right." Clearly, they were wrong. Dead wrong. Open, shut. Darkness, light. Good, evil. Right, wrong. We can't let ourselves forget it either. 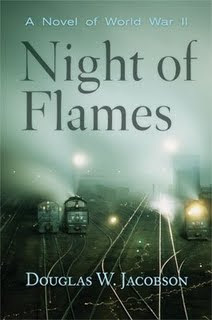 Night of Flames , a novel about World War II, is a great book for the story line. It revolves around the German invasion of Poland. The story flops back and forth between Anna, a Krakow university professor and her husband, Jan, a Polish cavalryman. The two are separated by the war and this follows both of their journeys through the war. It is a gripping story, a fast read, and is spell-binding. On the flip side, it is also full of foul language and one disturbing scene when Anna is captured by a particular Nazi officer. I appreciated neither of these things about the book although if I had to say one was better than another, I'd take the language as it was all directed towards people who deserved such words being used to describe them. I understand that World War II and all that it entailed was not a pretty thing. We cannot make war look attractive, nor should we. It is bloody, cold and mean. There is nothing nice about it. So I'd say there is an argument for having both of these things (language and the scene) included. I don't think that there's much that can be done to clean up war. And if I were in some of these situations, I can understand the desire to let the words fly. But don't pick up this book if these things make you really uncomfortable. The story that this book paints is bleak. A husband and wife are separated. Families are literally ripped apart. People die. Those who fight for truth are punished ruthlessly. But that is what evil does. It presents lies and claims they are perfection. It disrespects the tired and the poor while claiming to treasure what is best and most glorious in this world. Evil is a mirage. It is empty, hallow and undeserving and yet it is heralded as being a savior of the human race. It is not, nor can it ever be. Evil will lose the battle. Lies will be exposed and those that take pleasure in destruction will eventually be destroyed. This is what history teaches us. Lies will never succeed. They will be exposed for what they are and those that would shroud themselves in "best intentions" will fall and will not rise back up. If we take the time to learn history, we will learn this. Sometimes the nights seem very, very long. Certainly the period of time that this book covers (1939 - 1944/45) is one very long night of war. It is filled with pain and hardship that most of us cannot imagine. But joy does come. It must. It always does. It just sometimes take awhile. As the quote from Winston Churchill suggests, sometimes subtlety isn't really very useful. Perhaps if we made a more thorough, accurate and pointed study of history we would learn our lessons and not repeat them. If we do not, we run the risk of evil, such as what the Nazi's birthed, being reborn. But the same is true for us as individuals with our personal histories. Without examination of our own pasts and exposure of lies so that healing can occur, we are doomed to repeat the same mistakes. That is what makes this book so interesting and relevant to me. Anna and Jan took a stand for what they believed to be right and they both paid heavily for it. But in the end, they could stand upright, knowing that they were on the side of truth. It is the best side to be on. Certainly this is a difficult read but I would say that it is a profitable one. We must learn history - self, American, European, world. Just because we think that something has always been a certain way doesn't mean it always has or always should. We need to learn, as a people, to study the past and make practical applications for the future. So I welcome Night of Flames as a piece of historical fiction that attempts to help us remember the past, because it is something that should not be forgotten. I love WWII fiction. Thanks for the review! Have you read Tricia Goyer's WWII novels? I read one and enjoyed it. I think that they are loosely connected but not necessarily a series. Also she wrote an interesting series about the Spanish Civil War which happened around the same time and involved some US Troops.